Following the topic of the vital role that IT technology plays in the modern ports’ life, which was stressed by the recent cyber-attacks on the ports of Barcelona and San Diego, we cannot pass by the situation at Felixstowe and the vast consequences it is provoking in other UK and European ports. 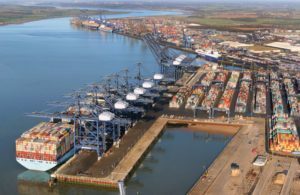 In mid-June, the port of Felixstowe, part of Hutchison Ports and Britain’s biggest container gateway handling over 4 mln TEU annually of about 17 various shipping lines, began implementing its in-house developed NextGen terminal operating systems (TOS). This has caused a chaos at the container terminal. At that initial moment, the effect “was like a cyber-attack had hit the port”, wrote The Loadstar quoting a source at the port. All the facility’s operations were affected causing severe operational delays. “At one stage we were reduced to pen and paper for stowage plans,” said the source disclosing a little what was happening at the terminal. Trying to cope with the situation and to calm down its worried customers, the port was issuing weekly status updates describing the amendments. But since 24 August, the port has been silent and no update whatsoever can be seen at its web site. According to The Loadstar, the port recently hired 30 tractor units from a major local trucking company just to shunt boxes to their correct stacks. And the port users – carriers, forwarders, service providers – cannot see any improvement anytime soon describing the situation as “complete chaos”. This has resulted in major shipping lines diverting their services from Felixstowe to other UK ports as from late July. Thus, Maersk Line shifted its Trans-Atlantic COEX and TA2 services to Liverpool, saying this would be a temporary measure, for 12 weeks. MSC now calls at DP World’s London Gateway and also decided to tranship the UK-bound cargo in Zeebrugge loading onto feeders to Liverpool, thus adding about a week to transit time. Despite Felixstowe’s optimistic statement that “the jointly operated Seago, Hamburg Sud and CMA CGM Levant service – the first to divert – returned to Felixstowe on 23 August”, CMA CGM announced end of August the reshuffle of its EPIC 1 service (Northern Europe – India) to London Gateway. OOCL shifted to Southampton its North Europe – Turkey service. Now the congestion is gradually spreading to other ports. DP World’s Southampton became the first to get affected, obviously by accepting additional volumes from the troubled Felixstowe. “DP World Southampton is currently experiencing very high stack levels which is impacting our productivity… The unusually large number of empty containers, coupled with the normal pre-season peak volumes, has put additional pressure on our yard. Boxes are therefore stacked more densely, limiting manoeuvrability, which means it takes longer to pick and load boxes,” says the port’s statement dated 28 September. 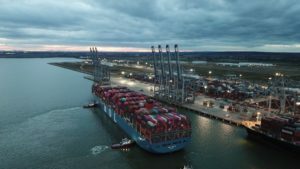 Earlier this week, MOL Truth, the 20,180 TEU-capacity vessel of ONE shipping line, had to call at DP World’s London Gateway instead of the congested Southampton. It has become the largest ever container vessel to sail the river Thames. Thus, the unsuccessful TOS implementation 4 months ago has triggered a severe congestion at the UK’s two largest box ports, just in time for the Christmas peak season, threatening timely deliveries of the seasonal goods and presents to the British market.